Wrapped around a lush garden La Rancheta is a small intimate place aimed at visitors who really want to relax and get away from it all. The Lonely Planet guide describes La Rancheta as "funky and simple" with an "eclectic cabin-in-the-woods feel". USD 28/night for a single private room, USD 35/night for a double private room, USD 65 night for the bungalow. Each unit has simple kitchen facilities and private bathrooms. Ron and his Dominican family also serve home cooked meals (order in advance) and specialize in Belgium and Dominican food. 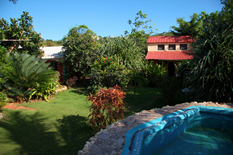 The Rancheta is two miles from the center of Las Galeras and a ten minute walk to the nearest beach.